Natasha Devon MBE is a writer and activist. 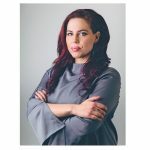 She tours schools and colleges throughout the UK, delivering talks as well as conducting research on mental health, body image, gender and social equality. She campaigns both on and offline to make the world a fairer place. Her current projects are the Mental Health Media Charter and wheresyourheadat.org, which aims to change the law to protect the mental health of British workers. Natasha writes regularly for the Guardian, is a former columnist for Cosmopolitan Magazine and currently has a weekly column in the Times Educational Supplement. Her ‘mind manual’ — ‘A Beginner’s Guide to Being Mental: An A-Z’ — was published in May 2018, by Bluebird Books at Pan MacMillan.